The Alkaline Water Company Partners with Water Source One Company. We could be wrong, but we’re guessing this agreement will enable WTER to meet it’s nation-wide customer demands, with a significantly reduced delivery expense – as water is heavy (obviously) and expensive to deliver to store shelves in the 50 states they currently sell into. This is important as it roles out numerous new brands and flavors as recently announced. Water Source One Production Facilities. SCOTTSDALE, Ariz., Jan. 18, 2019 (GLOBE NEWSWIRE) — The Alkaline Water Company Inc. (NASDAQ and TSXV: WTER)(the “Company”), a leading producer of premium bottled alkaline drinking water sold under the brand name Alkaline88®, today announced it has entered into a Management and Services Agreement with Austin, Texas-based Water Source One (“WSO”) to expand its production and distribution capabilities. Under the agreement, Water Source One will assist the Company in managing the production and distribution of its flagship Alkaline88® premium bottled alkaline drinking water across the United States, including providing customer service and regulatory support, quality assurance management, and raw materials and logistical support. Water Source One supplies from more than 30 strategically placed bottling facilities located across the U.S. that all meet or exceed FDA regulations and are Safe Quality Food (SQF) certified. These facilities are expected to enable the Company to lower shipping costs and solidify its growing national manufacturing footprint. Water Source One has the manufacturing capability to support the growing demand the Company is seeing for its products and to enable it to scale production and distribution as the Alkaline88® brand continues to expand. The Company expects to benefit from Water Source One’s experienced management team. Many WSO team members are long-term veterans from major beverage companies such as Nestle and Coca-Cola. Water Source One has a proven track record of success, with over 100 years of aggregate operating history and growth. 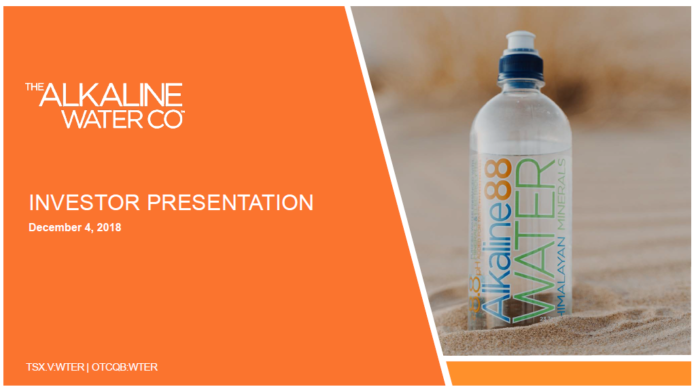 “We are thrilled to work with The Alkaline Water Company and participate in their remarkable growth, as more and more retailers and consumers across the country recognize the benefits of alkaline water and of their leading brand, Alkaline88®. Our bottling and distribution facilities will allow The Alkaline Water Company to continue its march towards full national coverage and our teams will work well together and complement one another to benefit both companies,” commented Dave Evans, President and CEO of Water Source One. About Water Source One Water Source One, headquartered in Austin, Texas, is a leading producer and supplier of branded and private label bottled water products in the United States. The company’s bottled water products include spring water, purified drinking water, distilled water and various enhanced bottled water products. These products are packaged in both PET and HDPE bottles and range in size from 10 ounces to 2.5 gallons. Water Source One is currently supplying bottled water products to major retailers from 30 bottled water plants across the United States. For more information visit http://watersourceone.com/. This news release contains “forward-looking statements.” Statements in this news release that are not purely historical are forward-looking statements and include any statements regarding beliefs, plans, expectations or intentions regarding the future. Such forward-looking statements include, among other things, the following: that the Company is confident that this partnership will allow it to aggressively scale the Alkaline88® brand and expand its infused beverage division; that the Company expects this partnership to benefit its product line in a number of ways and help it sustain continued growth; that Water Source One’s facilities are expected to enable the Company to lower shipping costs and solidify its growing national manufacturing footprint; that Water Source One has the manufacturing capability to enable the Company to scale production and distribution as the Alkaline88® brand continues to expand; that the Company expects to benefit from Water Source One’s experienced management team; that Water Source One is the ideal partner to expand the Company’s infrastructure to support its extensive growth plans; that the Company’s sales are expected to continue to grow exponentially with national account expansion, the addition of new sales channels and classes of trade, and international expansion; that the Company expects to launch infused beverages like our all-natural flavored Alkaline Water and Hemp Water, which is expected to further enhance its sales; that the partnership with Water Source One will provide the necessary production, distribution infrastructure and associated support the Company’s growth plans; and that Water Source One’s bottling and distribution facilities will allow the Company to continue its march towards full national coverage and Water Source One’s and the Company’s teams will work well together and complement one another to benefit both companies. Client, we are compensated by the company $2,000 per month and 1,000 shares per month for both Investor and Public relations services. Previous articleNew Age Beverages Announces Agreement To Develop And Distribute Marley Branded CBD-Infused Beverages. Next articleCrop Corp, (CRXPF) All Signs Poised to Massive Revenue Gains in 2019. Report Update $0.24.